For other rivers called Clearwater, see Clearwater River. The Clearwater River is in the northwestern United States, in north central Idaho. Its length is 74.8 miles (120.4 km),  it flows westward from the Bitterroot Mountains along the Idaho- Montana border, and joins the Snake River at Lewiston. In October 1805, the Lewis and Clark Expedition descended the Clearwater River in dugout canoes, putting in at "Canoe Camp," five miles (8 km) downstream from Orofino; they reached the Columbia Bar and the Pacific Ocean about six weeks later. At the small town of Kooskia, the Middle Fork and South Fork of the Clearwater River join their waters to form the main stem of the Clearwater. The larger Middle Fork is made up of the combined flows of the Lochsa and Selway rivers which flow from the Bitterroot Mountains located to the east, while the much smaller South Fork originates in the Selway-Bitterroot Wilderness to the south. From the confluence the Clearwater flows northwest, passing the Heart of the Monster site of the Nez Perce National Historical Park. U.S. Route 12 follows the river to Kamiah, where it is joined by Lawyer Creek from the southwest. The river then continues northwest through a canyon to the confluence with Lolo Creek from the east. It soon passes the town of Greer and receives Jim Ford Creek from the east. At Orofino, the river gains the waters of Orofino Creek and swings westward in a nearly straight line for about three miles (5 km), then receives the North Fork from the northeast at Ahsahka, close to Dworshak Reservoir. After the North Fork contributes its flow, the Clearwater continues west and receives Big Canyon Creek from the south, and Bedrock Creek from the north. As the river canyon cuts deeper into the Columbia Plateau, the Clearwater passes the unincorporated communities of Lenore and Myrtle, where it receives Cottonwood Creek from the southeast, and Arrow, where it receives the Potlatch River from the north. Lapwai Creek joins from the south where the river passes close to Spalding. Here, U.S. Route 95 crosses the Clearwater and is co-signed with U.S. Route 12 along the river's north bank for several miles (then diverts north to Moscow). The river soon widens and slows into the slack water of Lower Granite Lake as it approaches Lewiston. Just as it crosses the Idaho- Washington state line, it joins its waters with the Snake River. The Dworshak Reservoir is the only major lake on the Clearwater system, created from the Dworshak Dam, completed in the early 1970s. Dworshak Dam is on the North Fork of the Clearwater River, and is just northwest of Orofino. There is no fish ladder; the dam blocks salmon and steelhead passage. ^ "USGS Gage #13343000 on the Clearwater River near Lewiston". National Water Information System. United States Geological Survey. Retrieved 2010-03-09. ^ Rees, John E. (1918). Idaho Chronology, Nomenclature, Bibliography. W.B. Conkey Company. p. 64. 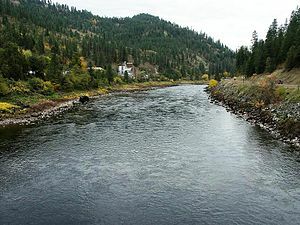 Wikimedia Commons has media related to Clearwater River (Idaho).